Well, let’s try guessing. 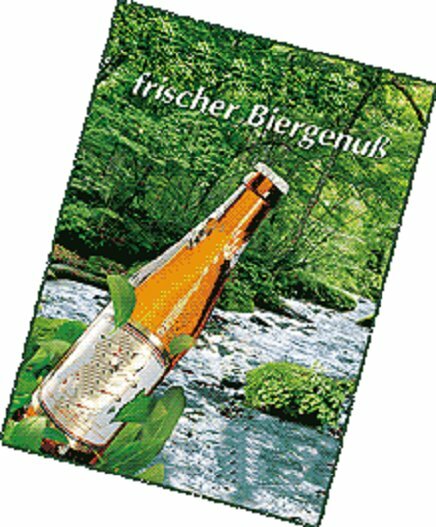 It’s pure, the brewing water is sourced from nature, it’s refreshing, clear – as it says in the slogan: “fresh beer indulgence”. With rich green colours and a gurgling stream, this really does tick off all the right boxes. Congratulations – not. But WHY SAY THE SAME THING AS EVERYONE ELSE, Hasseröder?! Yes, it was them. 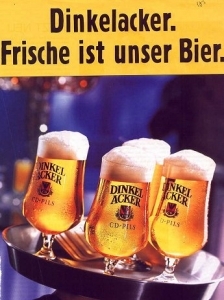 The ad actually said “Harz-like fresh beer indulgence”. Just to add the local aspect in the positioning. This was all around 5 years ago. About the same time two other beers were claiming “freshness” (careful, this ain’t purity, it’s more “we’ve only just made it” – the sort of product promise that would leave most beer drinkers in the UK much colder than the temperature of their ale). 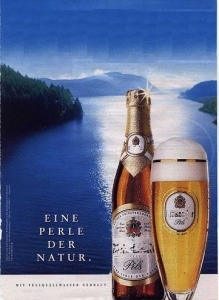 So Veltins beer was talking “Fresh Veltins” (and still is – they don’t keep changing their positioning), and even the Stuttgart brand pictured on the right was claiming it was “The first beer with its own birth date” (yes, the bottles had the date of production on the label, yawn). Hasseröder’s next cunning ploy: to say “Erfrischend Echt” (Refreshingly genuine). A kind of preference strategy combined with the freshness. The heritage from the Harz mountains was told to hop it. And now, having worked out that freshness is, after all, a generic (just like their previous positioning), Hasseröder has repositioned once again to start looking like the middle-aged men’s drink (VW Passat drivers, the sort of losers who go to model railway fairs; they traipsed round Germany watching as many matches as possible during last year’s World Cup). Now Hasseröder says: “Männer sind so” (Such are men – ok, not easy to translate). And Holsten have been saying this for a little bit longer than Hasseröder (though Holsten also abandoned its positioning of “Auf die Freundschaft” – here’s to friendship). So, let’s see where Hasseröder’s next attempt not to be generic will take it … back to its harzland? This entry was posted in Desire and tagged Dinkel Acker, Hasseröder, Holsten, Krombacher. Bookmark the permalink.